Fair enough. If it actually comes out with the old Hasbro logo, I'd be impressed - I don't think they've used that on anything, even faux-vintage stuff, for decades. FOC G2 Bruticus would like to have a word with you. Edited by Nevermore, 05 May 2018 - 09:14 AM. I throw myself upon the mercy of the court. I didn't do my research before making a wide-ranging statement and I accept all future counterexamples without complaint. "Has the Magistrate reached a Verdict?" Edited by Sabrblade, 05 May 2018 - 12:21 PM. I have had a very long couple of days and cannot parse that. I'll have to look again tomorrow. Here's a direct comparison between the Robot Kingdom image, a US-boxed G1 Hot Rod and a Canadian-boxed G1 Hot Rod. Whatever this packaging is, it's none of those two. Oh, I really want one, but at that price and given my collection, I have to question the practicality, especially with other stuff I want. Not a shock, but the stock photos have his shin stickers on backwards. Hopefully they aren't factory-applying those. I might pick this up just to carve out the blocks inside the knees and see how different the end result actually looks. His thigh and waist stickers are different. A lot more orange than before. The side of the car sticker is different too. The Targetmaster Reissue changed this to match the car mode, but that was painted on and a different design. After all these years I still can't believe someone okayed that package design. Yes, let's display 2 square inches of the product in order to spare some featureless red cardboard. Great! Now I really feel old! 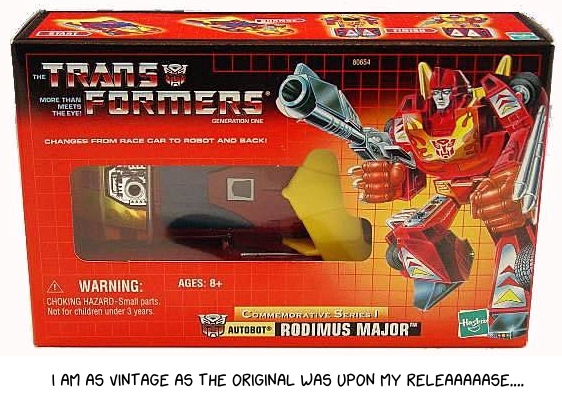 Commemorative Series Rodimus Major was released in 2002, which was 16 years ago. At the time of its release, the original 1986 G1 Hot Rod toy was also 16 years old. Edited by Nevermore, 21 May 2018 - 04:03 PM. The linked xkcd comic also helps, since it's following the formula of some of Time Ghost's factoids. Edited by Copper Bezel, 21 May 2018 - 04:24 PM.